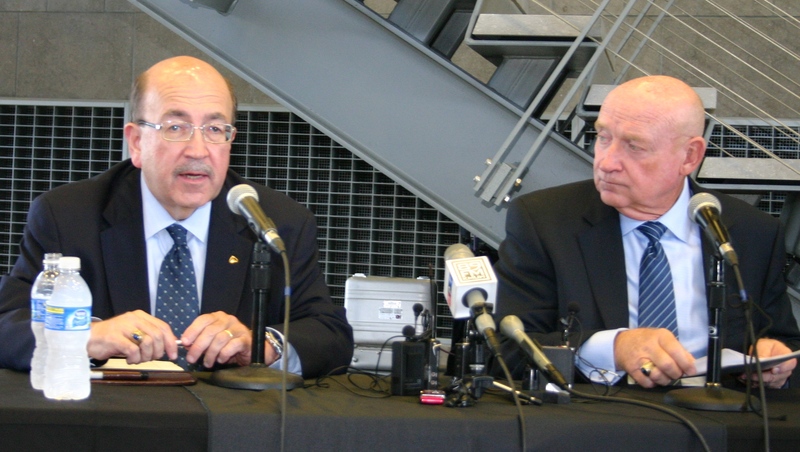 Kicking off the negotiations for 2,600 IAM members at Hawker Beechcraft, IAM President Tom Buffenbarger and Hawker Beechcraft CEO Bill Boisture voiced similar concerns about the state of the general aviation industry. Opening remarks by IAM International President Tom Buffenbarger and Hawker Beechcraft CEO Bill Boisture set the tone and established the priorities for the negotiations that will lead to a new contract for 2,600 IAM members at Hawker Beechcraft. Buffenbarger spoke forcefully on behalf of the workers at Hawker and the general aviation industry itself. “We’re not afraid to speak out when we’re attacked,” said Buffenbarger, who noted the IAM’s aggressive defense of the industry in the face of disparaging comments by President Obama and others about the use of business aircraft. The IAM President made an equally impassioned defense for workers’ defined benefit pensions, which join health care and job security as the top three bargaining priorities identified by members at Hawker Beechcraft. “One thing that still continues to work, even though it gets derided by Wall Street and investment bankers, is the concept of a good defined benefit pension plan. The pension plan that we have, that our members depend on, is of extreme importance,” declared Buffenbarger, who warned against the trap of benchmarking against other companies where pensions are being eliminated for new hires. The press conference to announce the opening round of talks was held at the National Center for Aviation Training, a large campus opened in 2010 to provide state-of-the-art training for up to 1,500 students at a time. The entire conference is available on YouTube from the Local Lodge. The opening remarks from CEO Boisture are available here, the opening remarks from IP Buffenbarger are here, and the Q & A from the press here.